Having a cast or bandage can be a very inconvenient time, where simple tasks such as showering or bathing becomes difficult! AquaStop is a waterproof cast and bandage protector that was created in order to help improve your day to day life with a cast a little easier. 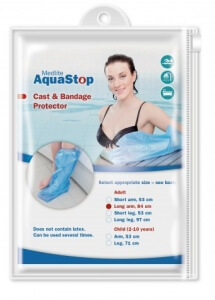 AquaStop creates a watertight seal that protects plastercasts and bandages, therefore enabling anyone with an arm, leg, hand or foot injury to shower, bathe or swim as usual. Due to the nature of the product, AquaStop is particularly good for covering a cast when swimming as when it is submerged in water it will create a strong, water-tight seal. Children sizes are for those ages 2-10 years old. AquaStop can be purchased from Crescent Pharma OTC at £12.99. Caution: Wet plastic is slippery. This is not a toy, keep out of reach of children. To be used for cast and bandage protection of the arms and legs only. To prevent ripping, do not trim with scissors. NextHello from the Crescent Pharma Team!